There’s no real recipe for this plate, or as I like to call it, “Clean Out Your Fridge Night”. It’s just a bunch of different things thrown together that I had sitting around in the crisper a couple of days ago. There’ll be more “Clean Out” nights later this week, as I prep to go food shopping over the weekend. 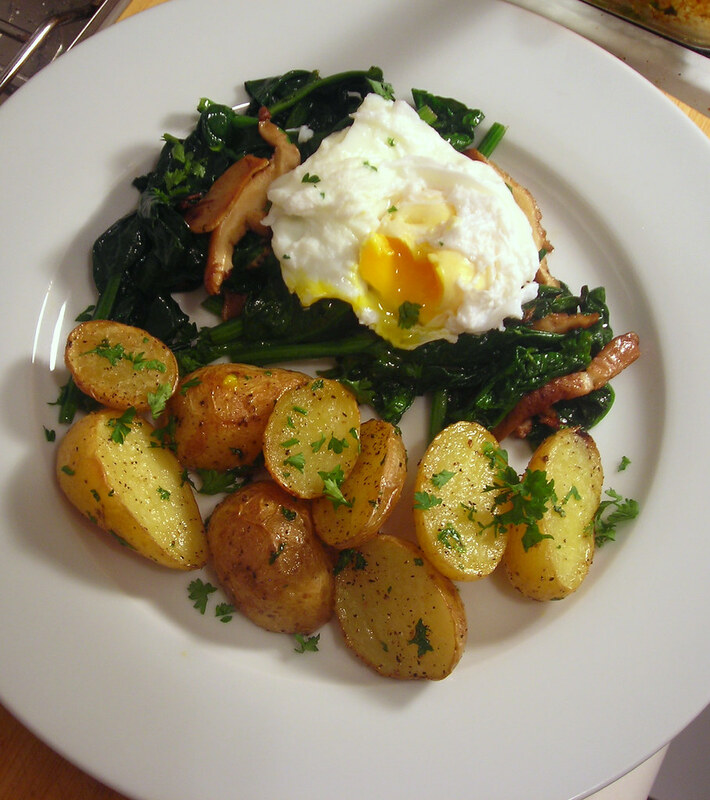 To view a brief demo on how to poach an egg, click here. The mushrooms were sautéed with a couple of tablespoons of unsalted butter, along with chopped rocambole garlic and spinach, then seasoned to taste with sea salt and black pepper. The potatoes were halved or quartered, then tossed with olive oil, sea salt and black pepper, and roasted at 350 F for 45 minutes. I sprinkled a bit of chopped parsley afterwards. Sometimes “simple” is exactly what you need. 23 Oct	This entry was published on October 23, 2012 at 1:38 pm. It’s filed under autumn, cooking, food, food photography, vegetarian and tagged autumn, dinner, eggs, food photography, gluten-free, potatoes, spinach, vegetarian. Bookmark the permalink. Follow any comments here with the RSS feed for this post. I cleaned out the crisper drawer and made a great soup/chowder. Isn’t it amazing how good those things turn out? This sounds very good to me. Drop by my kitchen and check out mine. http://www.tumbleweedcontessa.com We are hosting a Cookie Exchange. Post a cookie or candy recipe to our site. I will soon, Linda, and thanks for stopping by. I don’t eat dessert all that often though, so that will be difficult. I also don’t bake much, but that’s slowly changing. Has me drooling that’s for sure! I eat greens, eggs, and potatoes for breakfast often. Funny that I have been cleaning out my fridge too. I made butternut squash soup, salmon sandwiches, and a moroccan potato salad. have a recent injury so dinners this week aren’t going to be “complicated”. I saw a recipe elsewhere for Les Œufs En Meurette (poached eggs in red wine sauce, with onion confit, lardons and chanterelles) that I want to try. and there’s an article in this week’s Times on the wonders of quiche. I haven’t had quiche in ages. Want to try making pâte brisée, then a wild mushroom quiche since it’s the height of autumn in NYC. but all of that will have to wait for a while. by the way, this was dinner. sorry for the confusion.